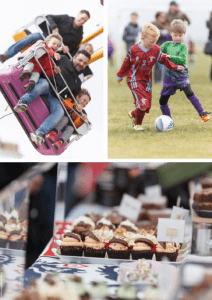 There are many ways to get involved in the Lytham St Anne’s St George’s Day Charity Festival, whether volunteering, taking part in our choir competition or joining our parade, there’s something for everyone. On this page you’ll find information for taking part in each event, as well as details on how to apply. This page also contains information for booking stalls and exhibiting at our events. If you have any questions about taking part in any of our events, please contact us. For information on volunteering during the St George’s Day Festivities, please see the information here. Download and complete this form to be considered for entry into our Choir Competition. To join our parade, register a float or a classic car, download and complete an application form. To register to exhibit at the festival, download and complete an application form. Forms must be returned no later than 1st April 2018. Trade Applications are being handled by the Creative Crafts Association so please visit their website to apply. The cut-off date is 1st April 2018. We’re starting to receive the first raffle prizes, but the more we have, the more we can raise for charity! To donate a prize, contact us, or send your raffle prize to; St George’s Day Festival, Dock Road, Lytham, FY8 5AQ.